In my react app I have a babylonjs scene component created according to babylonjs's example code and also am using the axis code from this example where onSceneMounted in React example is basically the createScene from axis example. What I would like to do is to instead of placing the axis to the scene origin in scene space, I would like to show them in upper right corner, similar to how Unity editor does it. The axes are always pinned to the upper right corner and are rotated according to the camera rotation. Browse other questions tagged reactjs babylonjs or ask your own question. React-router: How to manually invoke Link? 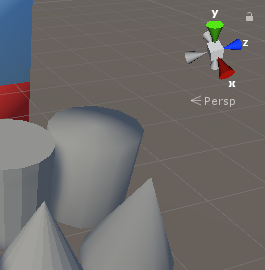 BabylonJS, how to rotate mesh instead of the camera? How to map control key to a specific angle or orientation? React Native - Using Two React-Native-Camera Components in Same App Causing Issues?